The cradle of civilization is a term referring to locations identified as the sites of the emergence of civilization. In Western European and Middle Eastern cultures, it has frequently been applied to the Ancient Near Eastern Chalcolithic (Ubaid period, Naqada culture), especially in the Fertile Crescent (Mesopotamia and Levant) and Egypt, but also extended to sites in Asia Minor (Anatolia), Armenia and the Iranian Plateau (Elam). Other civilizations arose in Asia, among cultures situated along large river valleys, notably the Indus River in the Indian Subcontinent present day Pakistan and the Yellow River in China. Civilizations also arose independently in Norte Chico in present-day Peru, the Andes, Mesoamerica, and Iron Age Sub-Saharan Africa. If writing is considered an indicator of civilization, the earliest "cradle" to have writing was Sumer (Jemdet Nasr) in Mesopotamia. Scholars have defined civilization using various criteria. The use of writing is a common one. Some standard criteria include a class-based society and public buildings. Current thinking is that there was no single "cradle", but several civilizations that developed independently, of which the Near Eastern Neolithic was the first. The extent to which there was significant influence between the early civilizations of the Fertile Crescent and those of East Asia is disputed. Scholars accept that the civilizations of Norte Chico in present-day Peru and that of Mesoamerica emerged independently from those in Eurasia. The concept 'cradle of civilization' is the subject of much debate. The figurative use of cradle to mean "the place or region in which anything is nurtured or sheltered in its earlier stage" is traced by the OED to Spenser (1590). Charles Rollin's Ancient History (1734) has "Egypt that served at first as the cradle of the holy nation." The phrase "cradle of civilization" plays a certain role in national mysticism. It has been used in Eastern as well as Western cultures, for instance, in Hindu nationalism (In Search of the Cradle of Civilization 1995), and Taiwanese nationalism (Taiwan — The Cradle of Civilization 2002). The terms also appear in esoteric pseudohistory, such as the Urantia Book claiming the title for "the second Eden," or the pseudoarchaeology related to Megalithic Britain (Civilization One 2004, Ancient Britain: The Cradle of Civilization 1921). The earliest signs of a process leading to sedentary culture can be seen in the Levant to as early as 12,000 BCE, when the Natufian culture became sedentary; it evolved into an agricultural society by 10,000 BCE. The importance of water to safeguard an abundant and stable food supply, due to favourable conditions for hunting, fishing and gathering resources including cereals, provided an initial wide spectrum economy that triggered the creation of permanent villages. The earliest proto-urban settlements with several thousand inhabitants emerged in the Neolithic. The first cities to house several tens of thousands were Memphis and Uruk, by the 31st century BCE (see Historical urban community sizes). Historic times are marked apart from prehistoric times when "records of the past begin to be kept for the benefit of future generations"; that is, with the development of writing. If the rise of civilization is taken to coincide with the development of writing out of proto-writing, the Near Eastern Chalcolithic, the transitional period between the Neolithic and the Bronze Age during the 4th millennium BCE, and the development of proto-writing in Harappa in the Indus Valley of South Asia around 3300 BCE are the earliest incidences, followed by Chinese proto-writing evolving into the oracle bone script, and again by the emergence of Mesoamerican writing systems from about 200 BCE. In the absence of written documents, most aspects of the rise of early civilizations are contained in archaeological assessments that document the development of formal institutions and the material culture. A "civilized" way of life is ultimately linked to conditions coming almost exclusively from intensive agriculture. Gordon Childe defined the development of civilization as the result of two successive revolutions: the Neolithic Revolution, triggering the development of settled communities, and the Urban Revolution, which enhanced tendencies towards dense settlements, specialized occupational groups, social classes, exploitation of surpluses, monumental public buildings and writing. Few of those conditions, however, are unchallenged by the records: dense settlements were not attested in Egypt's Old Kingdom and were absent in the Maya area; the Incas lacked writing altogether; and often monumental architecture preceded any indication of village settlement. For instance, in present-day Louisiana, researchers have determined that cultures that were primarily nomadic organized over generations to build earthwork mounds at seasonal settlements as early as 3400 BCE. Rather than a succession of events and preconditions, the rise of civilization could equally be hypothesized as an accelerated process that started with incipient agriculture and culminated in the Oriental Bronze Age. A traditional theory of the spread of civilization is that it began in the Fertile Crescent and spread out from there by influence. Scholars more generally now believe that civilizations arose independently at several locations in both hemispheres. They have observed that sociocultural developments occurred along different timeframes. "Sedentary" and "nomadic" communities continued to interact considerably; they were not strictly divided among widely different cultural groups. The concept of a cradle of civilization has a focus where the inhabitants came to build cities, to create writing systems, to experiment in techniques for making pottery and using metals, to domesticate animals, and to develop complex social structures involving class systems. In the United States and Canada, the AP World History teaches that the six early civilizations as the foundation of human culture are: "Mesopotamia, Egypt, Indus, Shang (or Yellow River valley), Mesoamerica and Andean South America. Historically, the ancient city states of Mesopotamia in the fertile crescent are most cited by Western and Middle Eastern scholars as the cradle of civilization. The convergence of the Tigris and Euphrates rivers produced rich fertile soil and a supply of water for irrigation. The civilizations that emerged around these rivers are among the earliest known non-nomadic agrarian societies. Because Ubaid, Sumer, Akkad, Assyria and Babylon civilizations all emerged around the Tigris-Euphrates, the theory that Mesopotamia is the cradle of civilization is widely accepted. The Mesopotamian civilization of Sumer emerges in the Ubaid period (6500-3800 BCE) and Uruk period (ca. 4000 to 3100 BCE), culminating in the mid-3rd millennium before giving rise to the Akkadian Empire in the 24th century BCE. This is often identified as the first empire in history. 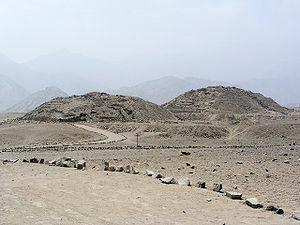 Eridu was the oldest Sumerian site, settled during the proto-civilized Ubaid period. Situated several miles southwest of Ur, Eridu was the southernmost of a conglomeration of early temple-cities, in Sumer, southern Mesopotamia, with the earliest of these settlements dating to around 5000 BCE. By the 4th millennium BCE in Nippur — in connection with a sort of ziggurat and shrine — a conduit built of bricks in the form of an arch. Sumerian inscriptions written on clay also appear in Nippur. By 4000 BCE an ancient Elamite city of Susa, in Mesopotamia, also seems to emerge from earlier villages. Whilst the Elamites originally had their own script, from an early age they adapted the Sumerian cuneiform script to their own language. The earliest recognizable cuneiform dates to no later than about 3500 BCE. Other villages that began to spring up around this time in the Ancient Near East (Middle East) were greatly impacted and shifted rapidly from a proto-civilized to a fully civilized state (e.g. Ebla, Mari and Assur). The rise of dynastic Egypt (known as Khemet) in the Nile Valley occurred with the unification of Upper and Lower Egypt in approximately 3200 BCE, and ended at around 343 BCE, at the start of the Achaemenid dynasty's control of Egypt. It is one of the oldest civilizations in the world. Evidence also indicates human habitation in the southwestern corner of Egypt, near the Sudan border, before 8000 BCE. From around 7000 BCE to 3000 BCE the climate of the Sahara was much moister, offering good grazing land even in areas that are now very arid. Natural climate change after 3000 BCE led to progressive arification of the region. It has been suggested that as a result of these changes, around 2500 BCE early tribes from the Sahara were forced to concentrate along the Nile river where they developed a settled agricultural economy and more centralized society. However it should be borne in mind that indigenous tribes would always have been present in the fertile Nile Valley and may have developed complex societies by themselves. Domesticated animals had already been imported from Asia between 7500 BCE and 4000 BCE (see Sahara: History, Cattle period), and there is evidence of pastoralism and cultivation of cereals in the East Sahara in the 7th millennium BCE. By 6000 BCE predynastic Egyptians in the southwestern corner of Egypt were herding cattle. Symbols on Gerzean pottery, c.4th millennium BCE, resemble traditional hieroglyph writing. In ancient Egypt mortar was in use by 4000 BCE, and ancient Egyptians were producing ceramic faience as early as 3500 BCE. Medical institutions are known to have been established in Egypt since as early as circa 3000 BCE. Ancient Egypt gains credit for the tallest ancient pyramids and early forms of surgery, mathematics, and barge transport. It is now recognized that the pre-Dynastic Egyptian states were part of a string of inter-related cultures along the Nile Valley as far south as Sudan. Some of these (notably Ta-Seti and the city of pre-Kerma) had monarchies and urban development by 3000 BCE and thus, together with Ancient Egypt, these African empires represent the earliest human civilizations. Pre-Kerma became the basis of the first Kushite empire (Kerma, c.2500-1500 BC). An archaeological site in the Gulf of Cambay off the north western coast of India includes submerged townships that may predate the oldest civilizations of Mesopotamia. While much conjecture exists around the implications of this discovery, the recency of the finding means that a consensus theory has yet to be established. Latest discoveries from Bhirrana, Haryana, in India since 2012 onwards, by archaeologist K. N. Dikshit indicate that Hakra ware from this area dates from as early as 7500 BCE,  which makes Bhirrana the oldest site in Indus Valley civilization. A piece of wood recovered from the site, possibly a tool, has been radio carbon dated to 7500 BCE, indicating settlement at a very early period. By 4000 BCE, a pre-Harappan culture emerged, with trade networks including lapis lazuli and other raw materials. Urban centers during this phase spanned what is now Pakistan and western India. 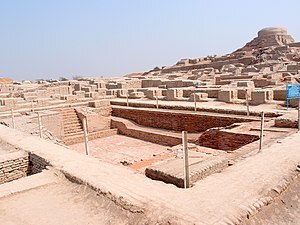 The Harappan phase is known to have comprised several large cities, including Harappa (3300 BCE), Dholavira (2900 BCE), Mohenjo-Daro (2500 BCE), Lothal (2400 BCE), and Rakhigarhi, and more than 1,000 towns and villages, often of relatively small size. The cities were perhaps originally about a mile square in overall dimensions, and their outstanding magnitude suggests political centralization, either in two large states or in a single great empire with alternative capitals. Or it may be that Harappa succeeded Mohenjo-daro, which is known to have been devastated more than once by exceptional floods. The southern region of the civilization in Kathiawar and beyond appears to be of later origin than the major Indus sites. The villagers grew numerous crops, including peas, sesame seed, dates, and cotton. The Indus valley civilization is credited for a regular and consistent use of decimal fractions in a uniform system of ancient weights and measures. Furthermore, the streets were laid out in grid patterns along with the development of sewage and water systems. This civilization of planned cities came to an end around 1700 BCE due to drying of rivers flowing from the Himalayas to the Arabian sea and geological/climatic changes in the Indus valley civilization area which resulted in the formation of the Thar desert. As a result, the cities were abandoned and populations reduced and people moved to the more fertile Ganges–Yamuna river area. Much remains unknown as the Indus Valley script remains un-deciphered. Archaeological sites such as Sanxingdui and Erlitou show evidence of a Bronze Age civilization in China. The earliest bronze knife was found at Majiayao in Gansu and Qinhai province dated 3000 BCE. The Yellow River was irrigated around 2205 BCE, reputedly by Yu the Great, starting the semi-mythical Xia Dynasty. Archaeologists disagree whether or not there is archaeological evidence to support the existence of the Xia Dynasty, with some suggesting that the Bronze Age society, the Erlitou culture, was the site of this ancient, first recorded dynasty of China. The earliest archaeologically verifiable dynasty in recorded Chinese history, the Shang Dynasty, emerged around 1750 BCE. The Shang Dynasty is attributed for bronze artifacts and oracle bones, which were turtle shells or cattle scapulae with markings reminiscent of ancient Chinese characters and found in the Huang He valley in Yin, a capital of the Shang Dynasty. Turtle shells from the Shang Dynasty have been carbon-dated to around 1500 BCE. Chinese civilization originated with city-states in the Yellow River valley. 221 BCE is the commonly accepted year when China became culturally and politically unified under a large centralized empire, the Qin Dynasty, founded by Emperor Qin Shi Huang Di. Successive dynasties in Chinese history developed bureaucratic systems that enabled the Emperor of China to control the large territory from the center. In the history of the Americas, civilizations were established long after the population of the continent. Several large, centralized civilizations developed in the Western Hemisphere: Norte Chico, Chavin, Nazca, Moche, Huari, Chimu, Tiahuanaco, Aymara and Inca in the Central Andes (Peru and Bolivia); Muisca in Colombia; Olmecs, Toltecs, Mixtecs, Zapotecs, Aztecs and the Mayas in Mesoamerica (Mexico and Central America). The oldest known civilization in South America, as well as in the Western Hemisphere as a whole, the Norte Chico civilization - c. 3200 BCE - 1800 BCE - comprised several interconnected settlements on the Peruvian coast, including the urban centers at Aspero and Caral. The presence of an early form of quipu (an Andean recording medium) at Caral indicates its potential influence on later Andean societies, as well as the antiquity of this unique recording system. The stone pyramids on the sites are thought to be contemporary to the great pyramids of Giza. Unusually among Andean cities, no evidence of fortifications, or of other signs of warfare, have yet been found in the Norte Chico. The Olmec civilization was the first Mesoamerican civilization, beginning around 1600-1400 BCE and ending around 400 BCE. This civilization is considered the mother culture of the Mesoamerican civilizations. The Mesoamerican calendar, numeral system, writing, and much of the Mesoamerican pantheon seem to have begun with the Olmec. Some elements of agriculture seem to have been practiced in Mesoamerica quite early. The domestication of maize is thought to have begun around 7,500 to 12,000 years ago. The earliest record of lowland maize cultivation dates to around 5100 BCE. Agriculture continued to be mixed with a hunting-gathering-fishing lifestyle until quite late compared to other regions, but by 2700 BCE, Mesoamericans were relying on maize, and living mostly in villages. Temple mounds and classes started to appear. By 1300/ 1200 BCE, small centres coalesced into the Olmec civilization, which seems to have been a set of city-states, united in religious and commercial concerns. The Olmec cities had ceremonial complexes with earth/clay pyramids, palaces, stone monuments, acqueducts and walled plazas. The first of these centers was at San Lorenzo (until 900 BCE). La Venta was the last great Olmec centre. Olmec artisans sculpted jade and clay figurines of Jaguars and humans. Their iconic giant heads - believed to be of Olmec rulers - stood in every major city. The Olmec civilization ended in 400 BCE, with the defacing and destruction of San Lorenzo and La Venta, two of the major cities. It nevertheless spawned many other states, most notably the Mayan civilization, whose first cities began appearing around 700/ 600 BCE. Olmec influences continued to appear in many later Mesoamerican civilizations. Samuel Noah Kramer (1969). Cradle of Civilization. Little Brown & Co. ISBN 0-316-32617-8. Georg Feuerstein (2001). In Search of the Cradle of Civilization. Quest Books. ISBN 0-8356-0741-0. Ethel Hofflund (2001). The Cradle of Civilization (Lifepac History & Geography Grade 6). Alpha Omega Publications. ISBN 0-86717-552-4. ↑ "Ancient China: The Yellow River Culture". www.wsu.edu. Retrieved 2008-06-10. ↑ 3.0 3.1 Mann, Charles C. (2006) . 1491: New Revelations of the Americas Before Columbus. Vintage Books. pp. 199–212. ISBN 1-4000-3205-9. ↑ Lua error in package.lua at line 80: module `Module:Citation/CS1/Suggestions' not found. ↑ La protohistoire de l'Europe, Jan Lichardus et al., Presses Universitaires de France, Paris. ISBN 84-335-9366-8, 1987, chapter II.2. ↑ Carr, Edward H. (1961). What is History?, p. 108, ISBN 0-14-020652-3. ↑ Britannica 15th edition, 26:62–63. ↑ "The Rise Of Civilization In The Middle East And Africa". History-world.org. Retrieved 2009-04-18. ↑ "Civilization". The Columbia Encyclopedia. Retrieved 2008-07-28. ↑ "AP World History". College Board. Retrieved 2008-07-28. ↑ "World History Course Description" (PDF). College Board. Retrieved 2008-07-28. ↑ "Ubaid Civilization". Ancientneareast.tripod.com. Retrieved 2009-04-18. ↑ "Indus Valley 2,000 years older than thought". ↑ "Archeologists confirm Indian civilization is 2000 years older than previously believed, Jason Overdorf, Globalpost, 28 November 2012". ↑ Encyclopædia Britannica. "Harappa (Pakistan) - Britannica Online Encyclopedia". Britannica.com. Retrieved 2010-01-09. ↑ "Early Indian culture - Indus civilisation". Retrieved 2009-04-18. ↑ Kenoyer, Jonathan (1998). Ancient Cities of the Indus Valley Civilization. Oxford University Press. ↑ "Agriculture's origin may be hidden in 'invisible' clues". Scienceblog.com. 2003-02-14. Retrieved 2009-04-18. This page was last modified on 5 May 2015, at 22:44.